La Villa At Vista Subdivision is in the Northeast Area of Tucson, AZ. 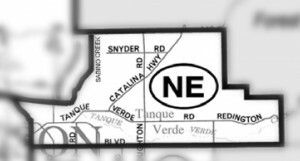 This Tucson subdivision is north of E. Tanque Verde and east of N. Sabino Canyon Rd. Shopping, restaurants, and activities can be a bit of a drive depending on the specific subdivision. The Northeast area is noted for Horse Properties. Large 1 to 3+ acre lots provide space for a home and horse facilities. There is a wide range of home choices available in the La Villa At Vista Subdivision and throughout the Northeast area. Some will offer an urban feel while others seem rural. The Tanque Verde Guest Ranch is a popular vacation spot for out of state visitors. The old west theme comes along with modern accommodations, good food, pool and, of course, horses to ride. Families living in La Villa At Vista Subdivision are served by the Tucson Unified School District – TUSD. Restaurants to visit if you are in the La Villa At Vista Subdivision are Eclectic Cafe and Gusto Osteria. Considering A Home In The La Villa At Vista Subdivision In Tucson, AZ? Are you thinking of buying a home in the La Villa At Vista Subdivision or another area of Tucson? Finding the right home can be a challenging process. But we can make the process much less stressful for you. Thinking about selling a home in the La Villa At Vista Subdivision?